Evolving science of gene therapy research. Insights for health care professionals. As a health care professional interested in helping your patients with inherited retinal diseases (IRDs), it’s essential to stay abreast on the science of gene therapy. aSharedVision is here to provide you with information and resources on this evolving branch of knowledge, particularly as it applies to the IRD community. Exciting developments in gene therapy research mean great potential for treating genetic disease—and hope for your patients with IRDs. Find out more about the history of gene therapy, how it works and some of the disease spaces scientists are currently focusing on. Gene-based therapeutic approaches include viral-based vector systems. Learn more about the various systems used in research and which have demonstrated the greatest success in clinical trials for in vivo gene delivery. Information to help you answer patient questions about gene therapy research. Plus, educational resources on gene therapy research and genetic testing you can share with patients or download for yourself and share with your patients. The potential of gene therapy. 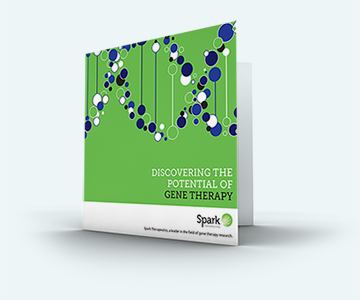 Get a big-picture view on gene therapy with this brochure, created for professionals: Discovering the Potential of Gene Therapy. Get email updates on patient resources and gene therapy education delivered to your inbox.